So the first big challenge I face with using Mark's method is that I paint in acrylics. I have painted with oils as a teenager, and then switched to watercolours (although in more of a gouache style), and recently discovered acrylics. I live in a small house with my wife and our 18 month old daughter, and we simply do not have the room for a proper studio. 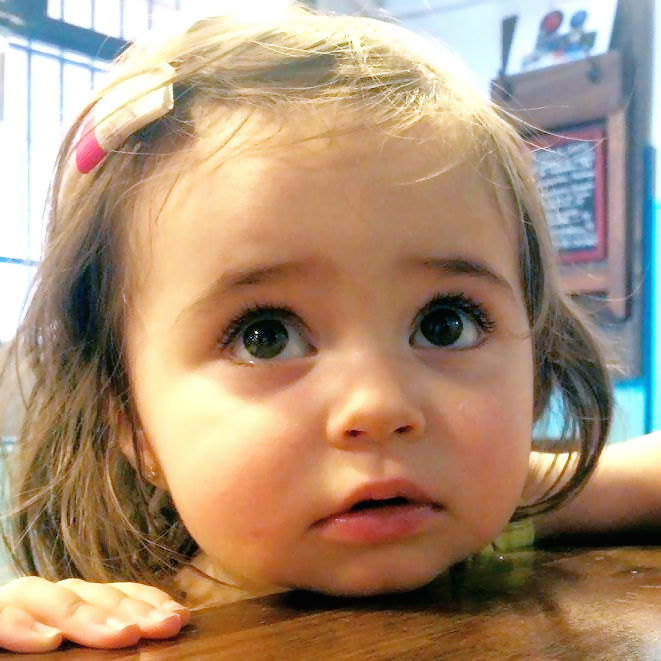 I also do not want to use any kind of thinners for oils that could be dangerous to our daughter. I live in England so I can't order (or afford) the Geneva paints. So.. acrylics. I really like using them apart from the incredibly quick drying time. This is a problem when trying to use the step approach as I won't be working wet on wet, but effectively wet on dry. Even though Mark says no blending at first it's inevitable that the edges of steps will be blended to some extent in Oils, but this won't happen in acrylics and so I will have hard edges. I also can't really paint out the steps on a palette in advance as even on a stay wet palette, thin layers of acrylic can dry (as I've discovered!) on the palette. However I have a few things to offset these disadvantages. First of all as well as painting, I also do computer programming and pixel art on the computer. So I have written a program which allows me to show the steps from an image. The hue and chroma are preserved (tone in Mark's terminology), whilst the value is fitted into a step range. I'm using this program to find the areas to paint for the steps more easily. I'm going to have to use more steps in some areas to make it easier to avoid too hard edges. 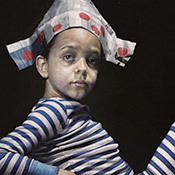 In terms of style I like realistic painting, although not the hyper-realism that some painters can achieve. I'll never have that level of skill, dedication and patience. I like something between hyper-realism and very loose brushwork. 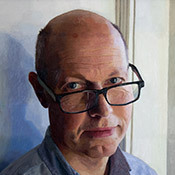 Oh, for subject matter I paint portraits (mostly friends and family so far). I forgot to mention that before.. Check out Atelier Interactive acrylics- they have a much longer open time, and can be reactivated. 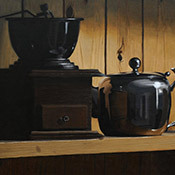 It is possible to work with oils without solvent, many people do. Thank you for that! I haven't heard of Atelier interactive acrylics, and they look interesting. I've seen the oil paint range produced by Winsor & Newton that is Water Mixable, so no solvents required, but they got mixed reviews online. Is that the kind of paint you were referring to? No not water mixables. Many people( as in oil painters in general) use oils straight out of the tube, some just use an oil such as linseed or walnut as a medium. The Geneva paints would be ideal but I can't get them where I am (Australia) either at the moment. I am painting using Marks method but not using the SDM because I paint in my home and have a young son. I have just kind of made up my own mix of linseed oil, stand oil and a little bit of clove oil- I expect this not ideal and have some reservations as to how archival this will be, however I am still learning the method for now and none of the pieces I am learning on will be sold. Using just straight linseed or walnut mixed in with the oil paint is archival though. I am hoping the Geneva paint will be available soon. I substituted Alizarin Crimson (no longer available as a pure hue due to lightfastness issues) with Perylene Maroon, based on the recommendation from the Handprint website on pigments. I also have some others 'power' colours as well if needed. What I didn't appreciate from watching Mark's videos and trying acrylic versions myself is just how much more opaque the oil colours are. What doesn't help is that the Ultramarine, Perylene Maroon and Burnt Umber are Transparent colours. Even the Cadmium Yellow (like other yellow pigments) isn't particularly opaque to me. So what I learnt is that I can't cover the background colour I've painted on the canvas with a single layer of paint. I tried to counteract that a little by using a mid-grey instead of a light-brown to try to remove any colour bias. But this just served to desaturate the colours and make things a little more blue tinted. This is with artist grade quality paint, so painting small details in one go isn't going to work. I've had to go over the same areas a few times and that's meant that painted areas lose detail a bit with every layer. For my next painting I'm going to try to block in the areas of the canvas with a close base colour so that there is not such a difference between the canvas colour (or undepainting in this case) and the detail work. To do this I'll use my program to find the basic areas and the correct values and tones and then block them in. The cadmium yellow and perylene maroon are much more expensive than the other colours, as well as student grade paints. One issue I have is that I work 2 minutes walk away from the art shop of a university which is in the top 10 in the country for art and so have discounted acrylic paints (and other supplies), but only Galeria and System 3 (student grade). These are much cheaper than the Professional Acrylic. So I've bought a set of these colours in the student grade too - as well as more opaque versions to test. If they work ok for me I'll try those, if not I'll use them for underpainting instead to save the more expensive paint. I've already done some strictly opaque based tests which I'll post as well. Thanks to Boudicca I now have info about the Atelier interactive acrylics which I might well try out as well. Here is a photo of the opaque testing I did with the various brands. Sorry it's not a great photo as I only have a cheap compact, not great lighting, and no photography skills! Each line of paint is divided into three sections, the first has one coat, the second part two coats, and the last section has three coats of paint - all applied when the previous layer was dry. - Professional Acrylic has a satin finish, all the others have a matte finish. Something to be aware of if using a combination of these brands. - I haven't got a dark red as much as Perylene Maroon in the student ranges here. Need to try to find one to test. The Cadmium Red hues in the student ranges are actually Napthol Red and seem a little more opaque that the artist range. 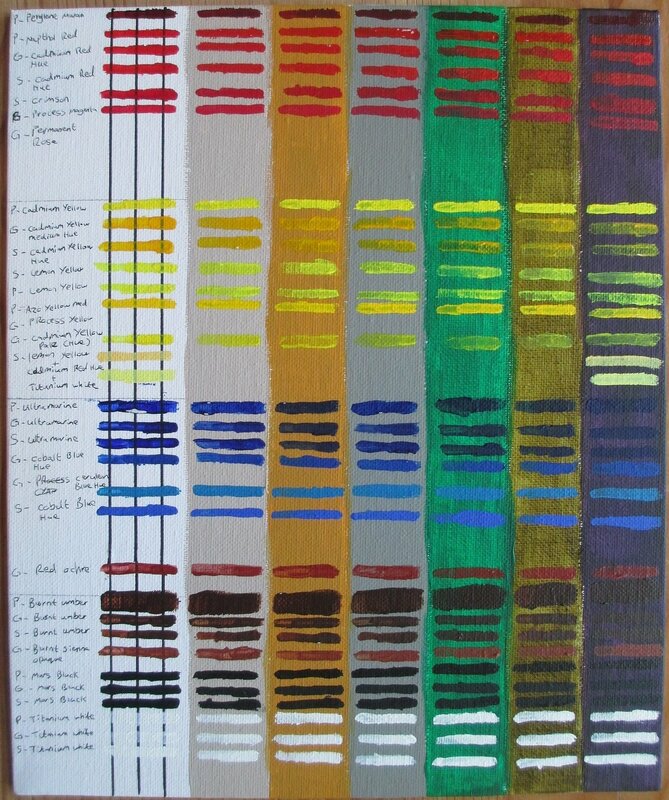 - As expected Cadmium yellow in Professional Acrylic is the most opaque of the yellows tested. Followed by Azo Yellow Medium from the Professional Acrylic range. However in terms of opacity there isn't much difference between the Lemon Yellow in the Artist quality paints, and in the two student ranges. - Burnt umber in the artist range is again a little better in opacity than the two student ranges. However like Ultramarine these pigments are transparent, so not much difference. The burnt sienna opaque is not as opaque in one coat as I expected, but with two or three coats does become nicely opaque. - Mars black in the professional acrylic range is the darkest valued black, followed by the system 3 black and then the galeria black. However the system 3 black has a satin finish and so in some lighting conditions appears more grey and shiny than the galeria version. For an unvarnished version the galeria is probably the better choice as although lighter in value it's totally matte. - Titanium white in the System 3 series seems much more opaque than both the galeria AND the professional acrylic range! This was a big surprise to me, and not sure why it's better than the artist quality paint. Thanks Kingston, I've heard a few people say Golden is the best. I've not seen it in shops here though as I think it's primarily an american brand. I can get it from the internet, though not sure how expensive it would be. I've been reading online and seen a few people review both the Golden Open and the Atelier Interactive ones. Some people prefer one, and some the other, and some neither! As always I'll have to try a tube or two and see what I think personally. 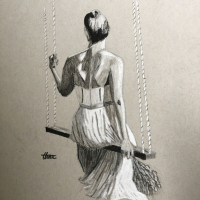 If I was more patient and cleverer I would have tried Mark's method (with modifications) on a small simple painting using just black and white to test out the values and how well the program I wrote works. Instead, being not so clever as I should have been I launched in to one of my favourite photos of my friend's daughter. Some background first though, the original photo was very dark and was facebook quality (i.e. 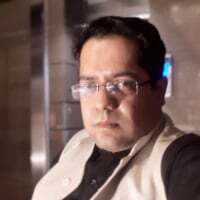 a smallish size and low quality JPEG). I boosted the lighting / expose as best I could, but I realise this made the whites blown out and the darks too dark. However I really like the pose, and the way the muted colours are offset by the cyan blue in the background and the pink in her hair ribbon. I find my eye is drawn from the cyan blue, to the pink, and then to her face. 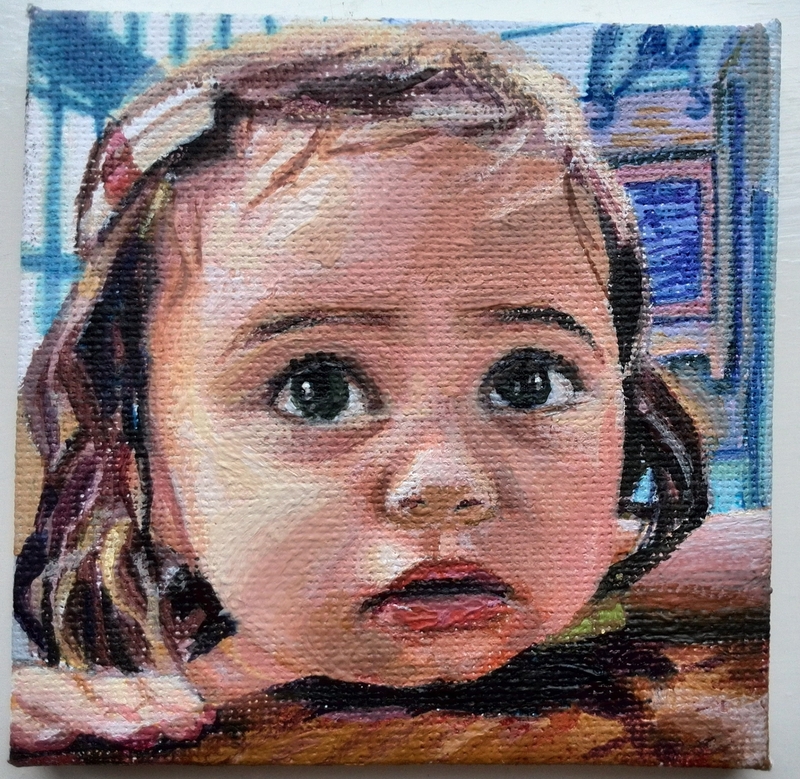 So I decided to paint this photo on this mini-canvas as a surprise gift to my friend of her daughter. This also gave me the opportunity to try out Acrylics for the first time (always used watercolours previously) and the small size made it easy to paint in the evenings with a one year old safely in bed. 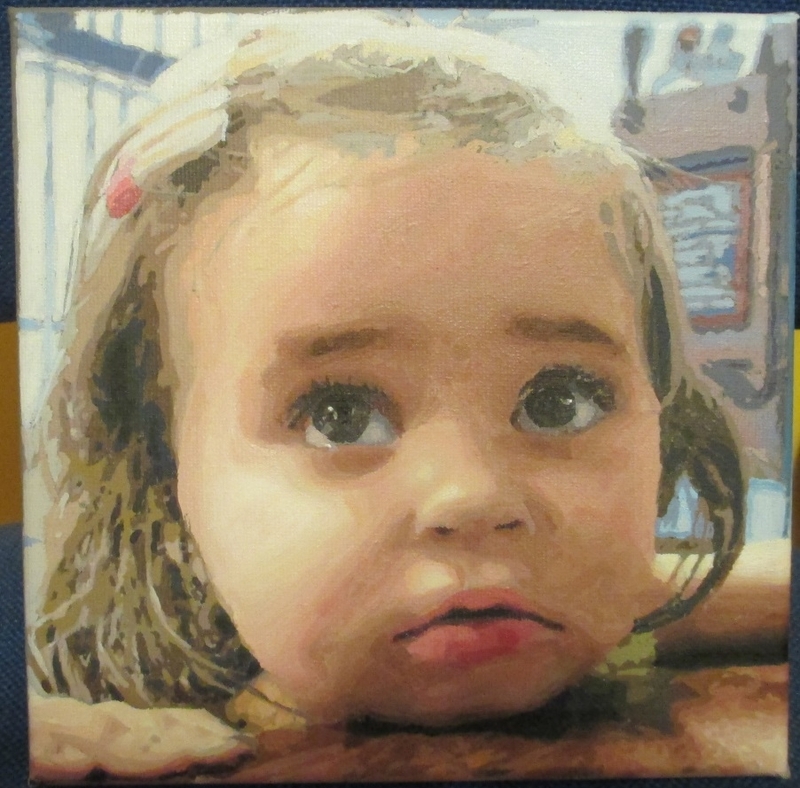 Well my friend liked it so much she commissioned me to paint two more pictures (one of her daughter, and one of her sister's daughter) for her mother. After that I stumbled on this website and thought I'd try to do a much larger version of this picture again using the new method and see how it went. You can see how with the increase in steps the picture starts to look more like the photo. Here I have isolated step 11 and zoomed in - the darker areas are the previous steps, the lighter area next to step 11 is where step 12 will go. You can see the change in hue and chroma (especially in the area where her cheek reddens and then shifts towards yellow near her neck). The histogram now shows just the colours used in this step and as the value has been fixed in the step, we have hue in the x axis and saturation in the y axis. I did two things wrong at this point that I will fix for the next painting. Firstly I was reading about how the eye is better at distinguishing value changes in the darker ranges than in the lighter range. This got me reading about gamma correction and other related information. So I added in gamma correction to make less of a difference in value between the darker shades. This was a mistake, and what I had failed to appreciate is that the darkest black available in pigments is considerably lighter than a black in real life, and even from a monitor. It turned out I was just making a few extra steps of very dark black colours that I couldn't really mix. The second mistake was that I was rounded the values down (I.e. 15->8, instead of 15->16). I should have rounded the values up as the titanium white is a much higher white value than the black value (see information about this on handprint.com). I decided to use 8 steps for the picture, apart from the face area where I would use 16 steps. 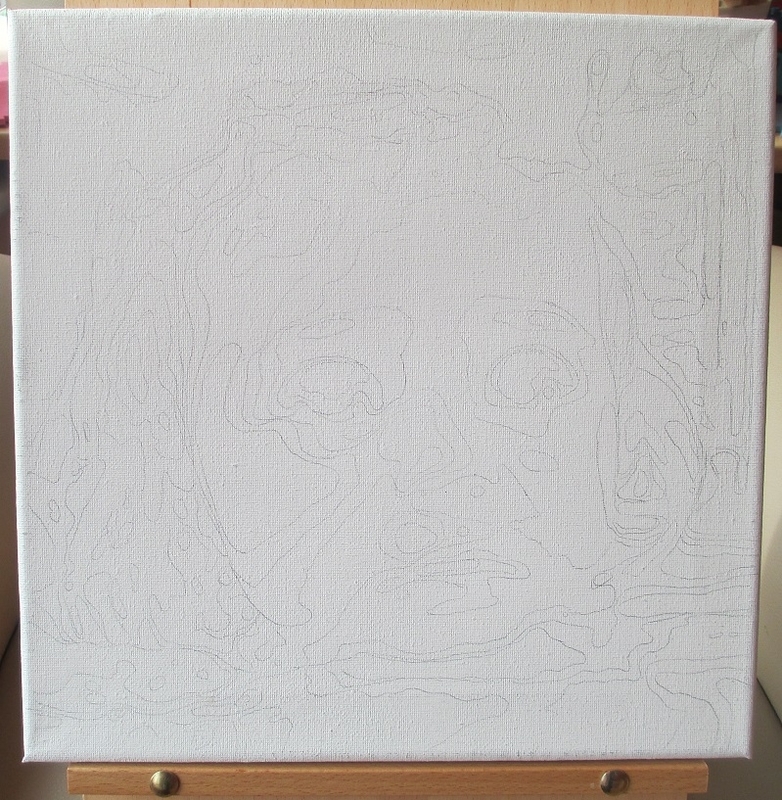 I then traced those steps onto the canvas via carbon paper (I now have graphite paper for the next picture). I reasoned that I would add these steps and then add the intermediate steps, so the 8 would become 16, and the 16 of the face would become 32. I used laminated photos for colour matching as per Mark's guide. With hindsight, it would have been easier to work one small step at a time, as it becomes harder to add in intermediate steps when you are working with so many steps already as the value differences become very small. This was compounded by the way acrylics dry so quickly and change in value, which made it hard to judge if a value and tone was right. I always viewed this painting as an experiment, but one I'll like to salvage if it went a bit wrong if I could. As I said earlier once I started to put in some larger step areas the colour become more grey/purplish due to the paints not being able to cover the background colour in one layer. I should probably have stopped, and redone the layer then, but I decided to keep going and see how it looked once the steps were all done. This meant I had to go over them again to add another layer with a better tone, losing detail around the step edges as I went. Then when I added intermediate steps I lost more detail, especially when I got some values and tones wrong and had to redo them. So here is where I am up to now.. (Sorry the photo isn't very good). The table, her arm and the skin on her face have been increased in steps. The background, hair, her hand, lips and her eyes haven't been increased. At the moment though I think there are such a lot of errors and it's looking overworked that it might be easier to try again with a different version of Mark's method. I'm thinking of blending between larger steps over an under-painting rather than so many steps. I don't know if that will work any better, but pushing myself by experimenting is helping me learn.. It's looking great. I hope you finish it. I think I will put this version on hold for now and try again with a modified technique. This will be experiment number 2! Ok, I'm going to try a different version of the step method for the second experiment. 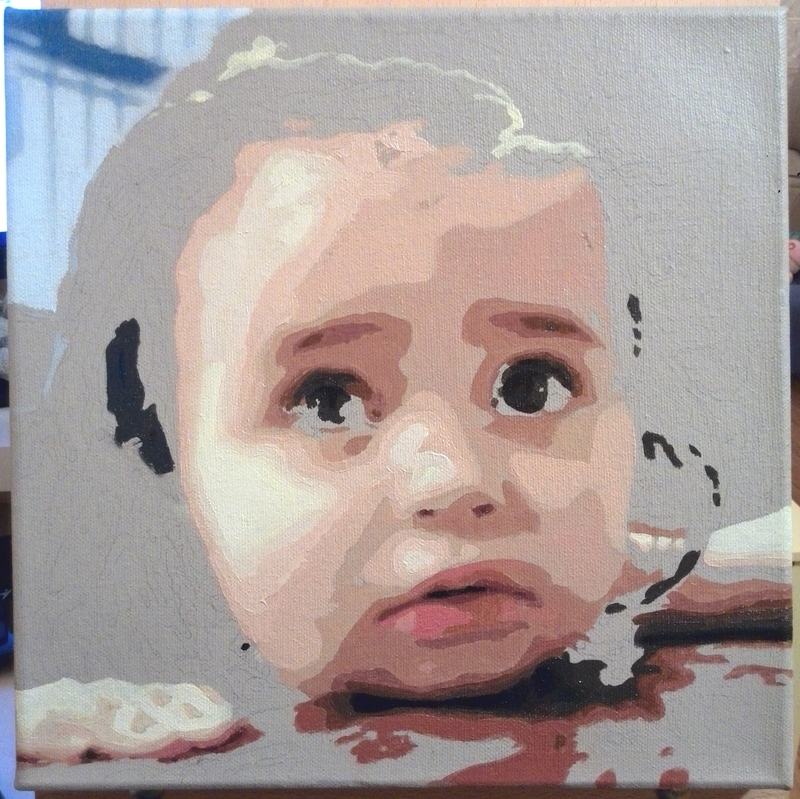 I've updated the canvas size to 12" x 12" (from 8" to 8") to give a bit more room to work with and I like the larger size. I'm going to block in two layers of underpainting this time instead of a solid colour background. I'll use student grade paints for this, both to save the more expensive artist grade paints I have and to get a feel for how they feel and work in comparison to the artist line. 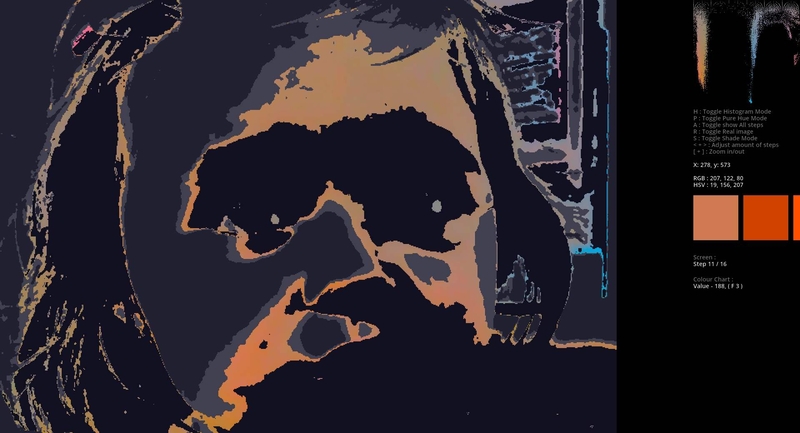 I have applied a largish median filter to the image to remove the fine details and show the broad areas and which tone and value they have in common. 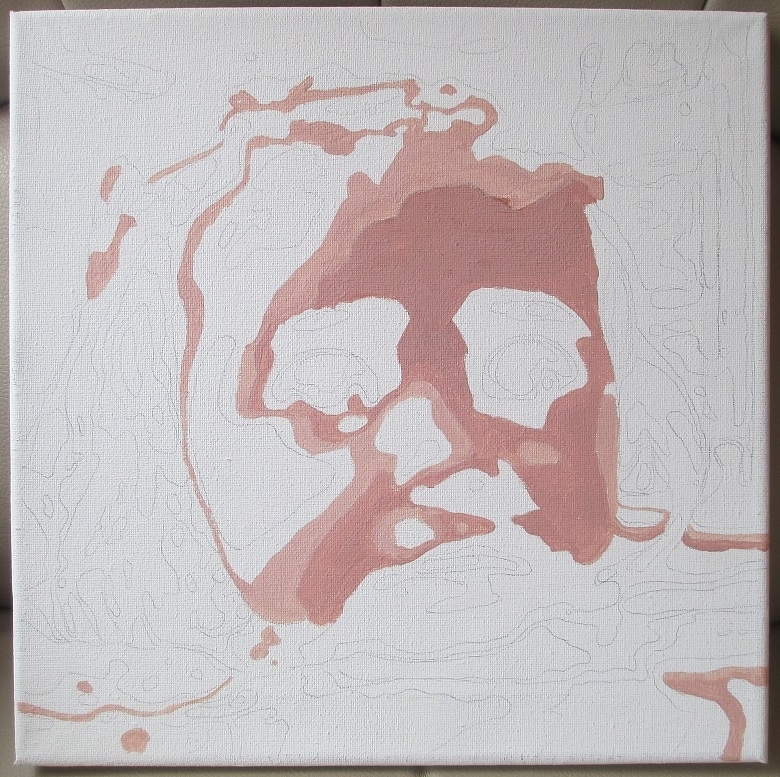 Then I've ran that image through my program and set it for 8 steps which I will use to create the underpainting. I'm going to make the underpainting a bit lighter than the real colours as Acrylics tend to dry darker I'm going to see if that helps with the colour working. Oh I'm also going to try to colour match against a series of colour charts I created and had printed off. Again, no idea if any of this is going to work, just experimenting! Better wish me luck!! congratulations Richard ! it already looks like you are on the road to a method that suits your needs ! all the best ! Two skin tone steps blocked in for the base layer. Sorry for the poor lighting, yellow LED bulbs here now it's night time. I can see what you are saying, but this is more of an experiment to try to find a method that works for me. It's also fun to experiment with things like this and if nothing else it's improving my skills with colour mixing. You are right that there isn't a lot of drawing and that's a rather mechanical method, but then the same could be said for Mark's method too. Yes, I must be crazy! It will come out just fine, the technique is very suited for acrylic, only difference is don't lay out all coulers at once. They will dry to fast. If you plan to blend then set to work on two ajoining groups at a time. If you want to try something cool, do a no blend, do one group at a time. Keep even sized strokes like "pointalism". Thanks Walko, the version I posted above is based on separate steps (just a lot of them). I'm going to try less steps but with blending next. 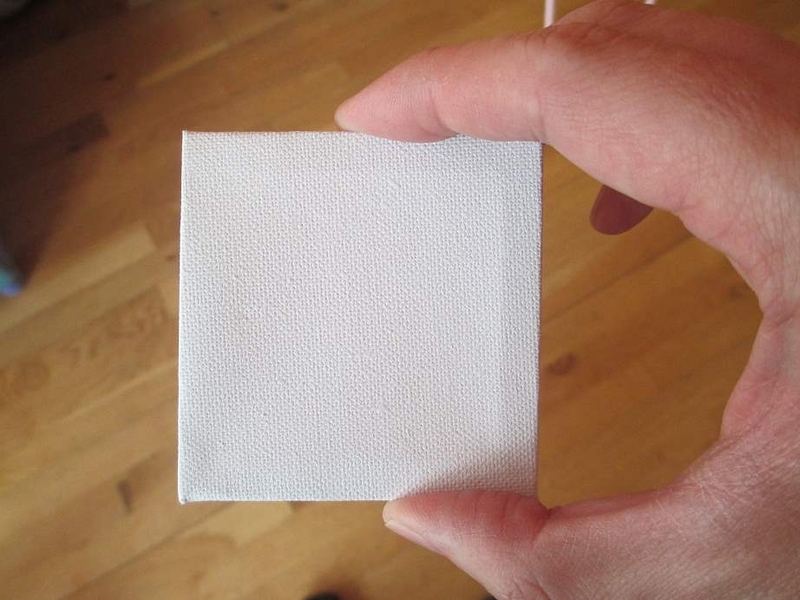 Have you got any pictures of paintings you've done in acrylic using this method? I've not been very well the last few days, so not been able to do any more painting. I've blocked in the rest of her face (and some other values of similar tone). Unfortunately some of the areas are a bit too watery and the tones/values aren't quite right.. sigh! The joys of experimenting with student quality paints as well. As I'm not sure at all that this will work, I'm going to start the proper painting on the forehead and the lit side of her face and see if it works or not..
Well as I half expected the graphite paper can't transfer well onto areas of the canvas already painted on. So this method isn't going to work. 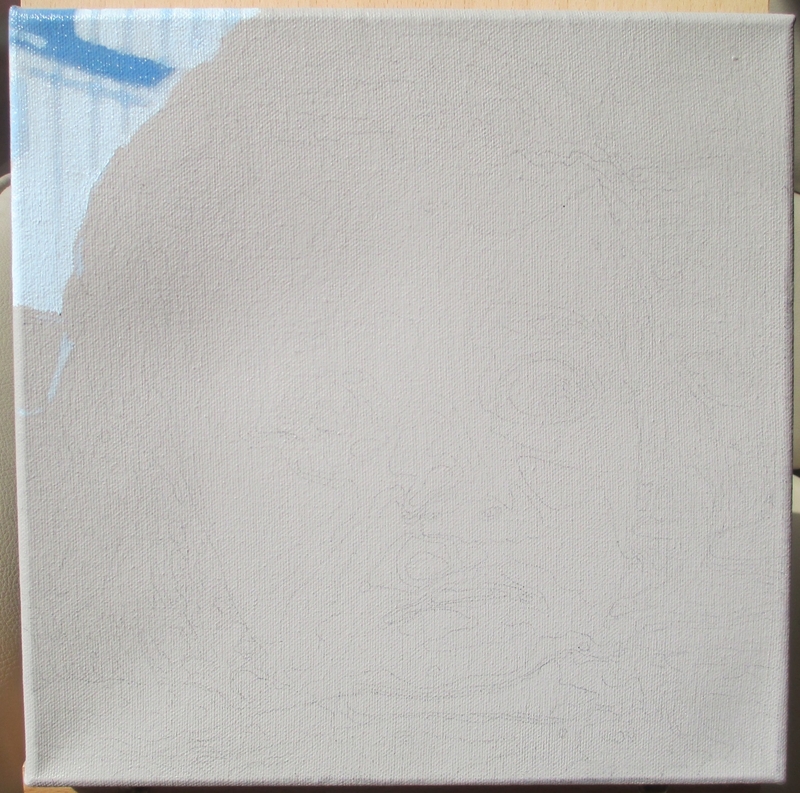 I will use this canvas for practising different ways to do the blending though, so it's not a total waste! I've read that W&N artisan paints are in between student quality and artist grade. 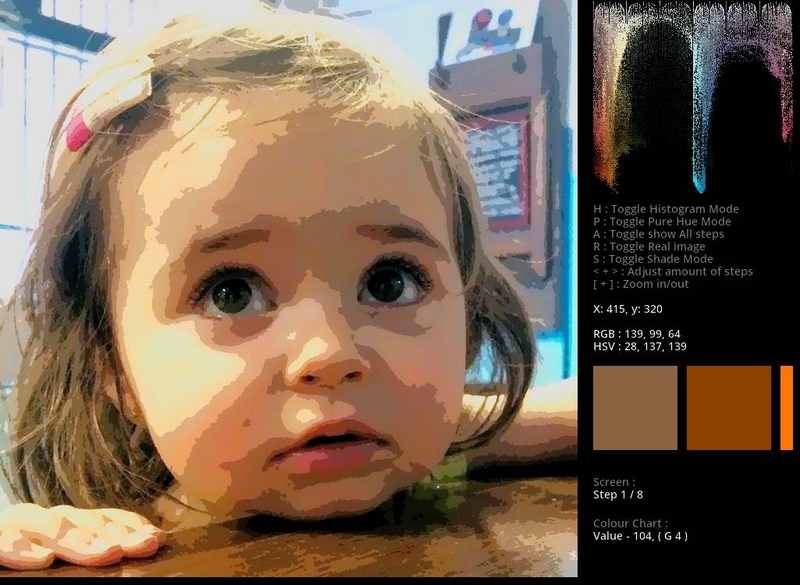 Holbein AquaDuo seem to get great reviews, but are very expensive. I'm trying some Cobra paints from Royal Talens which have good reviews too and were more affordable. So the Cobra paints have been ordered. I've picked the same limited palette colours as Mark's method. Unlike in the acrylics I even have the same red pigment PR264 available (Madder Lake in the Cobra range). The only thing I'm not sure about is that the Burnt Umber is made with PR101 (Red Iron Oxide) as well as PBk11 (Mars Black). All their earth colours seem to be based on PR101 or PY42 (Yellow Iron Oxide) and Mars Black, unlike the traditional PBr7 (Natural Iron Oxide). Still PR101 and PY42 are supposedly refinement on natural iron oxides and Burnt Umber using PBr7 is not an expensive pigment, so maybe it improves on the pigment in some way? I've stained a canvas with pale umber (acrylics) and painted a few coats on the underside of a glass panel too. 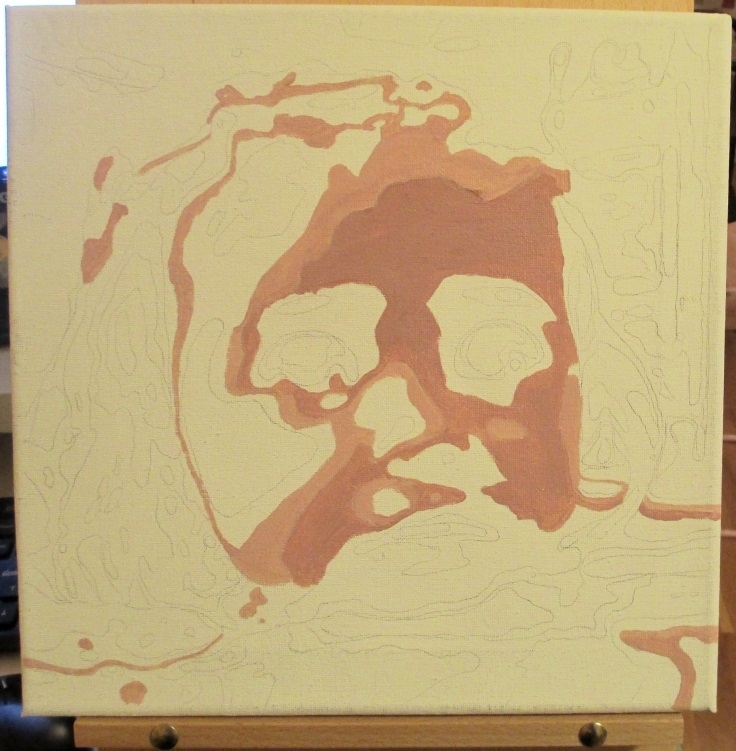 It's going to take a few more coats than with oils, and the pale umber is probably a bit too pale. We'll see how it goes.. it's certainly going to be strange working on glass for mixing! 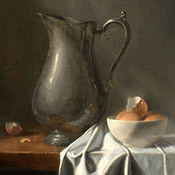 NOTE: The manufacture of most iron oxide artists' paints, including those with traditional names such as "earth", "sienna", "umber" or "ochre", has changed from the use of natural iron oxide clays — designated by the generic color index names PBr7 or PY43 — to the use of synthetic iron oxide powders. 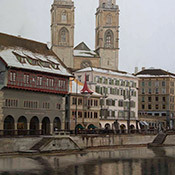 Small supplies of artists' grade natural iron oxides continue to flow from mines in Europe and the Middle East, but by 2002 there were no longer any suppliers of natural iron oxide pigments registered with the Society of Dyer's and Colourists' (UK) Colour Index. Many watercolors now labeled PBr7 or PY43 are actually made of mixed synthetic iron oxide pigments, not natural ores. In fact, iron oxides used in watercolor paints today include pigments formulated for use in wood or leather stains, or as plastic, ceramic or masonry colors, and are available in a very broad range of colors and grades. See for example the page "earth tones dry pigments" at the web site of Kama Art Materials (Montréal, Québec), the mineral and iron oxide pigments available at Sinopia Pigments (San Francisco, CA) or Kremer Pigments (New York, NY), and the pigment information pages at Société des ocres de France or their USA distributor, The Earth Pigments Company (Tucson, AZ). The use of natural oxides has dwindled so much that in 2001 the SDC considered eliminating the color index names PBr7, PR102 and PY43 from the Colour Index, and reassigning these pigments to the color index names for synthetic brown (PBr6), red (PR101) or yellow (PY42) iron oxides. However, manufacturers lobbied to retain these color index names as convenient "color" designations and desirable marketing labels. In 2007, the SDC reaffirmed to me that they were still deliberating on the issue. Ok, the glass palette is painted. It's a bit smaller than the sizes Mark uses, as it's A4 paper size (297mm x 210mm for those who aren't familiar with the A4 paper size). I found some photo frames with clipped back panels. As the glass edges are exposed they've been filed/ground so rounded. I know they are not safety glass, but I never paint when our daughter is awake, and all my paint materials are kept high up in a wardrobe that is hard for me to reach never mind her. Also I'm going to put the glass palette in the same closable thin file box that I'm using for acrylics. This is closable to keep the moisture in for acrylics, but will also keep the glass safe when I try the Cobra paints out. Yay The Cobra Water Mixable Oils arrived today. This coincided with our daughter being sick all over herself and her bed. I finally got chance to try out the Cobra Water Mixable Oils this evening. I've had very little free time as our daughter has been unwell these last few days. Feels very strange to be squeezing the paint out onto glass. Starting to grab colour from the squeezed out paint was harder than I thought as the paint seemed to stick together more than acrylics, and being on glass was much slippier at first. No smell from the paints, maybe a very faint smell, but a lot less than actylics! Mixing colours is very sticky and not as easy as I thought (this is pure paint with no medium). Titanium white, where is your tinting power? :P Either I put too much of the other colours in or for some reason acrylic white tints more strongly. Applying first strokes, very opaque and good coverage (better than acrylics), but slightly ragged edges as so thick. Not fluid, (is the word 'stiff'?) to work with? I mixed two skin colours from a laminated photo, took a while to get them right as needed a lot of white. Paint wiped off easily with a wet cloth from the lamination. Keep looking at the paint expecting it to dry! Blending between areas of paint is soooo easy. Tried out non-toxic artisan water mixable thinner. Made the paint much smoother and more fluid to work with.Still felt like oils when applying to the canvas. Easier to spread over the canvas, some loss of opacity. Then tried out water as a thinner (some guides recommend only using water for cleaning brushes), seemed easy to mix in with the paint became much more fluid. Easy to do washes, felt more like watercolours than oils, and more transparent then using the thinner (although I may have used more water). Felt like it would dry quicker than using the thinner. Washing up the brushes in a pot of water - most of the pigment removed. I only needed a little soap and water to remove the rest. Easy to use, no smell! Thanks David, when mixed with the thinner they are still very smooth and oily to work with. Without trying normal oils I can't really compare though. The cobra range is supposed to be more buttery and smooth than other WMO brands. I've bought the Water Mixable Oil versions of the mediums: Linseed Oil and Stand Oil today (as well as the non-toxic thinner I already had). I've just tested out all 3 and wanted to document my thoughts while they are still fresh in my mind. The stand oil is every bit as thick and viscous as I've read and seen in Youtube videos. Surprisingly for me though the resulting paint when applied is more transparent than with the other two mediums. The thinner works well and is transparent in colour. Like the other mediums it does make the paint more transparent as well, and it's still slightly 'scratchy' to pull the brush over the canvas. Linseed oil seems to work similar to the thinner (which perhaps has linseed oil in it?) but being an oil it does make the brush glide more smoothly over the canvas. Overall I like this feel the best, but only concerned about the yellowing nature with pale colours. However if I've only using small amounts maybe it will work ok? Not sure if it's possible to mix the oils together in some combination to make any kind of more effective medium as Mark has done. I'm a bit constrained in that I want to keep the water mixable nature in order to make it easy to clean up. Today I had my first attempt at using the Water Mixable Oils. Here you can see I have worked on the blurred (and very light) window in the top left background. 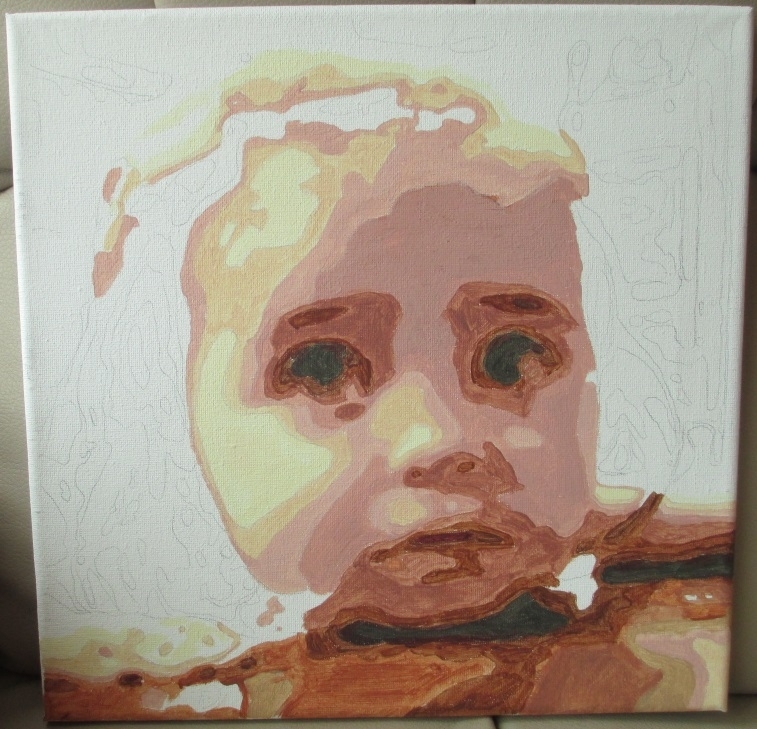 I started with a simple area where the blending capability of oils would work best. As always with my cheap camera and lighting (sorry Kingston!) the photo doesn't show the painting fully. It's going to take a while for me to get used to Oils compared to Acrylics. The feel is very different. This was done with a step method and then manual touching up of some area afterwards. I've been off work this week, but helping look after Alice (our daughter - 19 months old) so that my wife can get things done (which is impossible with Alice around!). As such at the end of the day when she's in bed I've often felt too tired to paint. So progress has been very slow this week. This is the hard yards stage of parenting- they have the physical capability to get themselves into a lot of trouble but not the brains to get themselves out. It gets better....then they become teenagers.....may the force be with you. Struggling a bit at the moment. I messed up some of the brighter colours (too yellow) due to not having a great quality print out. I've printed out a better version and had to overpaint some parts. Well, I'll post another progress picture once I have fixed some more colours. Just finished another painting session, so here is where I am up to now. I started to get a bit lost with all the steps so decided to work on less steps at first to get used to painting with oils and working on this picture, and then add in the in-between steps. I wasn't going to do this after the acrylic version, but due to the blend-ability of oils I think I can manage it.